I am now working on the scenery from the edge of the small shelf up to Waldron which is on the right side of my layout drawing. The buildings will be covered in different posts on there own. This is what it looks like at the start and how it has been for a while. 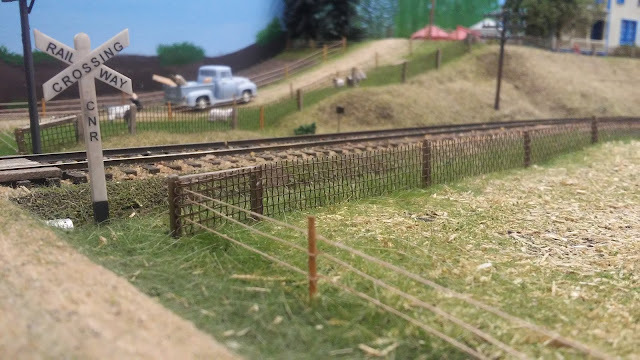 In Oct I added the page wire fence on both sides of the right-of-way and painted the first coat on the telegraph poles to make them look aged. Some have the white paint on the insulators. They will get translucent green next to highlight the glass insulators. That is a diamond harrow draw bar in the field at the back. I have not built the harrows yet but have them drawn in CAD. I am thinking of building a pull type rock picker to add to the scene also. I have made the drawings for it. You can see the white sign for Waldron, the small one further back is the whistle sign and the one closer to the bridge is the flanger sign. I also have just painted the backdrop. This field has just been seeded. The field in the front will be stubble that is being summer fallowed. There is a barbed wire fence that will get added coming out to the front. And one going to the back on the other side of the track. This shows where the oil pump jack is going to go. Not really a Saskatchewan thing but I spent a lot of my career in the oil patch be it in large plants. But back in 1978 a farm kid from Sask worked for a year for a company out of Nisku Alberta that repaired these and we traveled all over the province. The steel bins are just resting there for now. These bins model 1650 bushel 5 ring Westeel or Rosco bins. They are actually Rix N scale bins that scale out really well. If you take 1 row of rings off you would have a 1350 and if you add a row you would have a 1950. 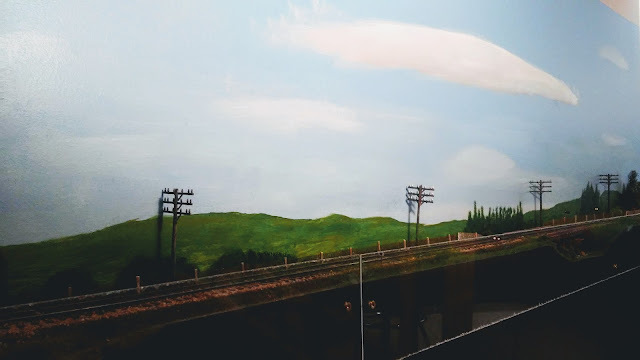 I have painted in the road on the back drop. The monument and sign just to the right of the bins is where the last spike went in back in 2010. You can also see the flanger sign. This photo shows how far this series of posts will go. 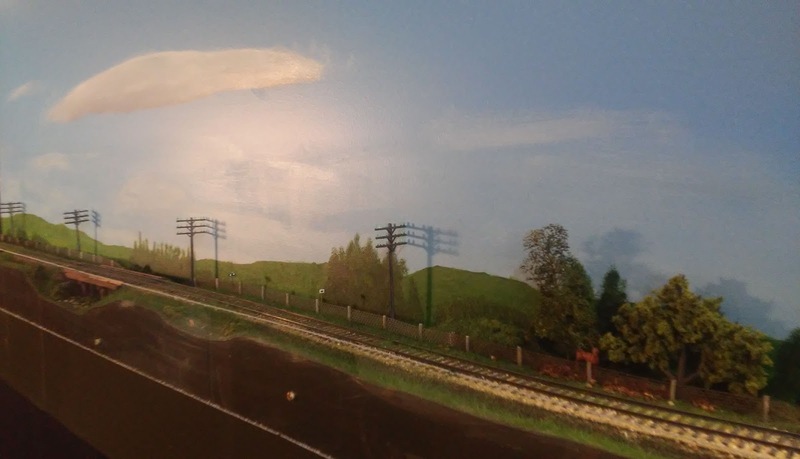 The rectangle drawn on the scenery is where the station is going. This will be an E Class GTP. That is a passing siding on the right. The 2 red bins are scratch built and represent plywood bins that were relatively common and hold 1350 bushels. You can now see how the painted road has changed to the way it was painted, although the angle is a little steeper than it looks straight on. There is a loading platform where the boxcar is sitting. The thing at the coupler on the gondola is the brakes. It is a pin with green tape on it. If a car will not sit still the crew can apply a brake. Still need to add the wheel stops to the ends of the rail. The idea is there will be a steel scrap pile where the gondola is currently sitting. Also still need fence on the right hand side of the right-of-way. Here is closer look at the snow fence. It is all styrene with 1x4 and 2x6. The posts are 6x8. The grass it seems to photograph really brown so I will have to fix that. It is a light green but you just do not see it. I will continue to add posts until this piece of scenery is complete. 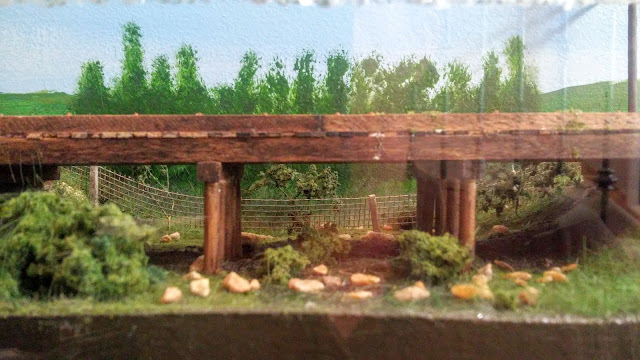 I am currently working on scenery and thought I would take you along as I am working on it. This will be a series of posts. This narrow shelf is on the right had side of my layout drawing. It is 5' long and 4.5" wide. The scenery on this was completed in Sept. I painted the back drop, added the fence to the right-of-way, added the static grass, weathered the road bed and added a piece of snow fence. The bare spot at the end is the start of the next piece of scenery to Waldron. There is a strip of Plexiglas on the left to keep things off the floor. The shelf was built this small so there would be enough room to move things from the stairs to the other room. The page wire fence is some window screen cut 4 scale feet high. It is the closest thing I could find. The posts CN used were ceder mine are balsa stained to age them. I just cut the posts strips out of a sheet and then chopped them to length. The vast majority of the right-of-way had this type of fence because when these lines were built the vast majority of farmers had livestock. 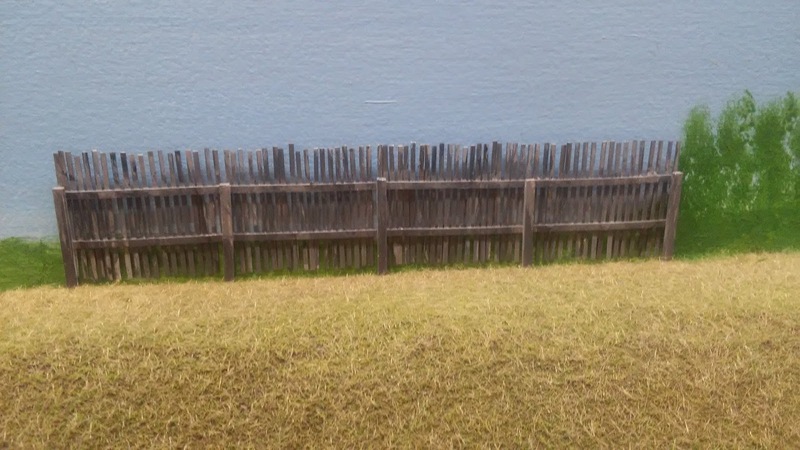 The barbed wire fence is styrene .02-.04 rod painted wood brown. The barbed wire is grey coloured thread. I ended up picking this colour as you can see it so it get bumped less. 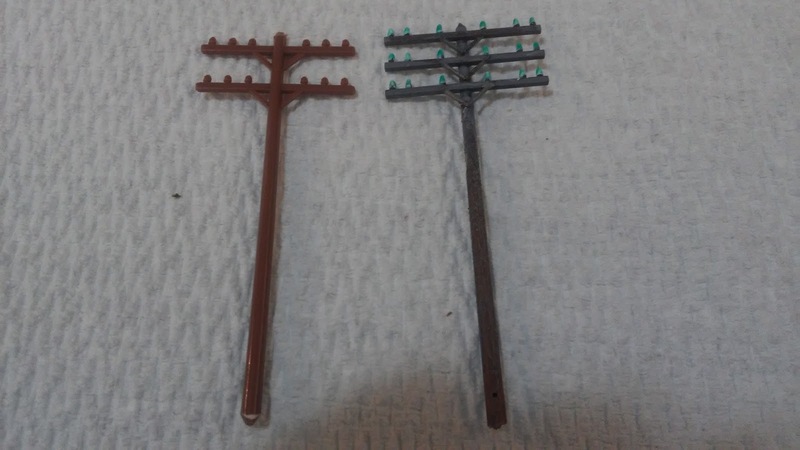 I can't remember who made the telegraph poles. I first drag the main pole with 80 grit sandpaper to give the plastic some wood texture. Next I weather them with white paint and black fabric dye see the link weathered wood on how to weather plastic to look like old wood. 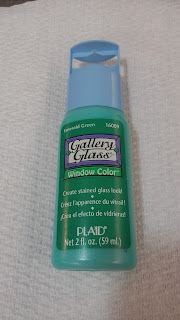 I then paint the insulators white acrylic and then paint them with a translucent green from Gallery Glass...... The last step is to paint the support braces a steel or dark oxide colour. This looking back the other way. The farm is around the corner. You can see the whistle and flanger signs on the right side. The snow fence is between the 2 signs. I thought this was an appropriate time to do a post on this topic as I have just recently done a tuneup on on my JMRI operations with some help from the JMRI users group and Dan in particular. There were a few things that I needed to understand better to improve car movements. This extra knowledge will enable me to help others also. I have been using JMRI since 2010 and it has worked well, I am just trying to make it run better in the prototypical way that I prefer. I also use TT & TO to run my operation sessions. When I started out I used car cards but found this to be a bit cumbersome and so I switched to JMRI operations which handles all my car movements. I never did get to the part of having to build all the card holders and such. Like most things in each system has a few points that may result in compromise. Living in the Edmonton area where we have 10-12 layouts doing operation sessions that use both methods there are always conversation about it. I also use JMRI Decoder Pro and can't imagine running without it - I will cover this topic in another short post. None of of my comments in this post are meant as a slag against how anyone else runs their operations. The great thing about JMRI is that it is open source so you do not need to purchase it to get to play with any of its features. I use other open source programs like Libre Office, LibreCad, and Gymp which are all open source programs that are free. It does take a bit of time to set it up very similar to creating all those car cards. The JMRI site gives you access to a very well written manual. Now I know most of us are men and do not need to read manuals "hahaha" but you do need to read this one, most likely a couple of times before you start. and a couple of times after that. It does take a little maintenance but so does flipping all those car cards before each session. The purpose in using any computer program is to make repetitive tasks much easier and it does just that. JMRI Operations generates manifests and switch lists for trains that are printed out on 1 or 2 pages, which is easier for new operators to use since they have a sheet that gives them instruction on what to do. There are even switch lists for the yard operators. They do not have to handle a stack of cards which for a 30 car train is about an 1 1/4 " thick and for the yard ops this can be huge. For example my yard is on the smaller side but still holds 70 cars. The other thing this does is tell operators exactly what track the cars are going to as you can see below in Melville. Below is a what a manifest for through freight 715 looks like. Rivers is in east staging and Watrous is west staging. The one thing that JMRI operations doesn't do well is block cars so I use this manifest to block the cars before a session starts. This is done in staging. The first paragraph is mostly instructions I have added. This way even new ops have this with them all the time they are on this train. Rivers is really just showing what cars and power 715 is leaving staging with and what track their train will be on. In this case the train will be on track 6. Next it shows places they will pass and that there is no work there. Then we get to Melville and it shows what pulls and spots there are and what tracks the cars are going to or coming from. 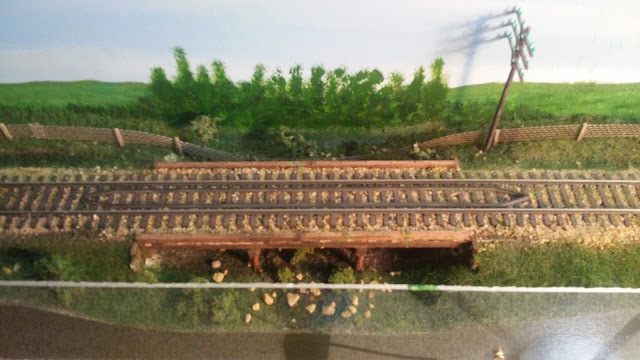 The yard master will usually sort the pull cars ahead of time to a track and if busy the yard master can have the train drop all the cars to track 2 to keep things moving and move them later. Watrous shows what cars you have and what track you are going to in staging. All my trains depart and arrive on the same track in staging. Each track just has different virtual names. Upon arriving in staging the train is reversed on the loop and then stored on its track. It will leave Watrous next trip as 716 east bound. Drop cars to Track 2 at Melville and pick up cars from Track 3 West. At Melville take on fuel. Steamers can also take on water. The manifest makes it easier for ops that are new to operations as everything is explained. There is also a switch list for the yard that shows what cars they need to spot and pull from local industries. I also have a train lineup sheet that the yard master can look at which tells what trains are coming including the extras which are not on the time table. I don't normally have a dedicated dispatcher except for me so it works well on my layout. The biggest thing I am trying to achieve is a less stressful atmosphere for new people to operate in. In another post we will look at the paper work I use during operation sessions.